Augmented Reality & Co. – Slingshot (previously known as AR Group) to represent Indonesia at SXSW Interactive Trade Show 2017 in Austin, Texas. Slingshot (previously known as AR Group) to represent Indonesia at SXSW Interactive Trade Show 2017 in Austin, Texas. 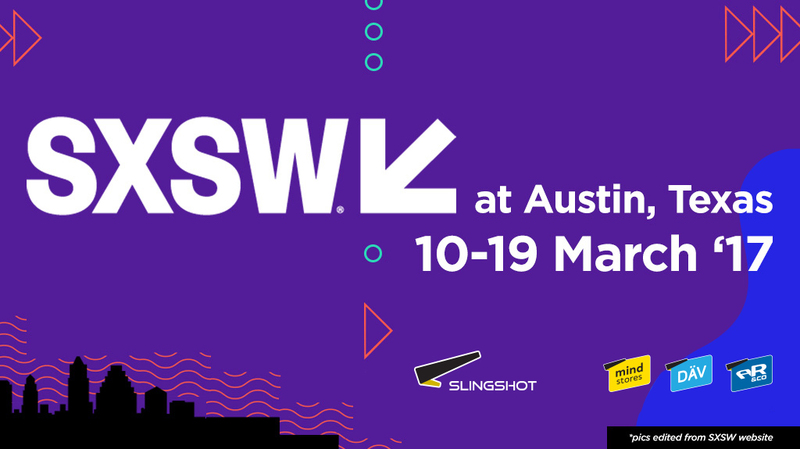 Slingshot (previously known as AR Group) is one of the five Indonesian companies that have been chosen to represent the nation at the South by Southwest (SXSW) Conference and Festival, which runs from March 10-19 in Austin, Texas. Slingshot was selected for participation in SXSW 2017 Interactive Trade Show by BEKRAF (Indonesian Government Agency for Creative Economy) along with four other national technology leaders, they are, Go-Jek, PicMix, GDP Venture and Emtek alongside 5 Indonesian start-ups. This prestigious event in Texas annually plays host to the most diverse, collaborative and innovative communities in the world. “We are honored by this opportunity to represent our country at this world class event. As a global company, coming from Indonesia, this is indeed a golden opportunity for us to showcase our creative and innovative technological achievements, which are highly relevant in today’s marketplace”, said Slingshot CEO Daniel Surya. Having served more than 20 countries globally with presence at various key cities including Singapore, Silicon Valley, Los Angeles, New York, Barcelona, and Malta, Slingshot has positioned itself as a globally heralded and pioneering leader in the field of Augmented Reality technology. The largest Augmented Reality and Innovative Technology company in Asia, Slingshot has received numerous awards for creative technology from international bodies, including for two years in a row, being awarded as “Best Augmented Reality Campaign” category winner at the Augmented World Expo in Silicon Valley, California (USA), listed as one of the Global 40 Most innovative companies awarded at the London Stock Exchange, Gold category winner at the SMARTIES APAC for its project in Vietnam, Best Use of Technology Category winner at the Marketing Events Award 2013 (Singapore), Asia’s Best Entertainment Channel 2012 by the 3rd CMO Asia Award (Singapore), The Most Innovative Game by Indonesia Game Show 2012 (Indonesia), listed in Asia’s Best Study Case 2010 by TechinAsia, and one of its units namely MindStores is being awarded as the world record holder for being the first 3D virtual store network presented by MURI Indonesia in 2016. Supported by the highly experienced team of management, creative, and engineers, Slingshot has been selected to represent the nation as its solutions have been proven as highly relevant to the market by serving some of the best brands from across industries such as Disney, Cartoon Network, Castrol, as well as developing an application for the recent Nigeria’s presidential election. In 2016, It also delivered an Augmented Reality application that was shown during the launch of the latest flagship store of Billionaire Boys Club in New York – owned by international artist Pharrell Williams, and launched a series of Augmented Reality collectible pins series for Star Trek Franchise at the 50th Star Trek Anniversary convention in Las Vegas and New York Comic Con. “It is one of the top three Augmented Reality companies in the world. Proud to be working with them to create a cutting edge products for our company.” said Dan Madsen who is a partner at Fansets and former president of the official Star Wars Fan Club as well as publisher of the Star Wars insider magazine. The South by Southwest Conference and Festivals is one of the world’s most notable events, celebrating the convergence of interactive technology, film and music industries. Over the years, the event has positioned itself as the premier destination for discovery. Founded in Austin, Texas in 1987, SXSW is best known for its conference and festivals, which have become an essential destination for global professionals, featuring sessions, showcases, screenings, exhibitions and a variety of networking opportunities. As noted by Wired.com, SXSW is a forward-looking event aimed at understanding the future and featuring exciting keynote speakers including Barack and Michelle Obama, as well as celebrated individuals from across artistic disciplines, such as JJ Abrams, Kirsten Dunst, Jake Gyllenhaal, Ethan Hawke, Guillermo del Toro, Snoop Dogg, Lady Gaga, Joss Whedon, Rob Zombie, and many more. Slingshot CEO Daniel Surya noted that the cream of the global creative crop will gather in Austin and his company is proud to carry the flag of Indonesia to the event. “This will certainly give the world a different look at Indonesia and our creative capabilities,” he added.